Penning down one's own grievances, apportioning blame on all and sundry except oneself and finally getting down to exposing non-existent military secrets is the way most military writing in India is heading to. Gen Musharraf's book has a role to play, Jaswant Singh has a mole to reveal and Gen Mallik has a hole to plug. One fails to understand why military writing has fallen to such pathetic levels especially in India. Perhaps, it is the lure of easy money to be made out of sensationalism at the cost of intellectual honesty. Contrast the above with the early military writings of Thimayya etc of the 1960s and 1970s. The books were small, honest and eminently readable. The aspect of sensationalism and commerce were absent. The goal was to satisfy the reader rather than oneself. Utilization of space for a nation's economic and social well-being has been acquiring increasing important over the past five decades. At the same time the use of space for military purposes started to develop rapidly, so much so that it began to have a profound impact on every aspect of warfare on ground, at sea, and in the air. The more recent wars, in fact, have led to the conclusion that future warfare is going to be controlled, prosecuted and dominated with the help of space capabilities. It is not surprising, therefore, that ever since space-based and/or space-enabled military capabilities started to impact warfare demonstrably, especially in recent wars, countries started to focus increasingly on leveraging space capabilities for military purposes. The recent 'one-to-one' of top military brass in full public and media glare only lowers the esteem of the forces even further. Putting it into print for posterity is only going to make it worse. Rather the top brass should turn its attention to one of the finest treatises of military writing in the recent past. 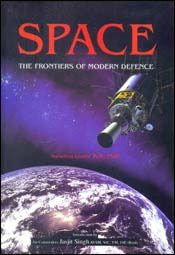 The book 'Space: The Frontiers of Modern Defence' authored by a young serving Squadron Leader of the Indian Air Force (Sqn Ldr KK Nair) redeems my intellectual faith in the IAF and the fine body of men it represents. Reading the book is an absolute pleasure unlike the insufferable non-sense of most retired military brass. For a refreshing change, he airs no grievance, is direct in his approach to the subject, simplifies the entire affair of space militarization, weaponization etc and again makes reading the eminent pleasure it used to be. The best part is, the book is rooted in the future; the promise of the future rather than a lamentation of past grievances and follies. The only ray of hope appears to be Sqn Ldr KK Nair's book on space. Older retired generations like mine love to lament on falling standards, the situation appears to be the other way around! The younger generation is smarter, better informed and more rooted in reality than most of us. Cynics might hit the bar and lament again over gin and spirits or during golf on Sunday. For a change, pick up the Sqn Ldr's book on space and get a few valuable lessons on major and minor staff work. The book is available at USI library or with Knowledge World publishers, Daryaganj New Delhi. A collector's pride in the classic sense. My personal congratulations to the Sqn Ldr and the IAF for the fine quality it can boast of.